Janissaries or Mamlukes were Christian children and slaves raised in the Islamic faith and trained as special (Kamikaze) soldiers to protect the Turkish Sultan and his interests throughout the Ottoman Empire. The Sultan gave the Janissaries full authority in levying taxes. They were responsible to the Sultan and reported direct to him. They increased in manpower, grew in strength and became very powerful and influential. They were known for their notoriety, for their wheeling and dealing and blackmail. Other Janissaries of either gender, were also used as domestic servants for the elite and as public janitors, doing menial work and running errands for their Turkish masters, especially the military corps. In times of war, the Janissaries were used by the Turkish armies as human shields in their attacks of enemy troops and invasion of enemy fortifications. The Turks used the Janissary as a dispensable commodity. Growing in manpower and military strength, the Ottoman Turks feared the Janissaries and decided to get rid of them. The Ottoman Government put the Janissaries to the sword in masse. Those that were spared the sword were dumped in Turkish colonies, spread throughout North Africa and the Balkans. Many Balkan Moslems are residues of the Janissary Mamlukes. In the Abode of Peace, some Islamic governments appoint members from the non-Moslem indigenous national groups in high governmental posts by royal or republican decree. Like window dressing, they are appointed in high positions without any constitutional power, void of authority. They are only there as figureheads, occasionally sent on special missions to represent their governments on official matters of high importance. Yet, they lack the authority to make decisions on the same issues they had been sent to discuss. Islamic governments display such Christian officials before the international community to dispel their fears and to demonstrate to the world that their method of assimilation of the natives with the Moslem society runs without a hitch. Like stationery items, Islamic governments requisition and use such Christians to serve their purpose and later dispense with them at will. Egyptian Boutros Ghali, Iraqi� Tariq Aziz and �Palestinian� Hanan Ashrawi are just a few. Such Christians have no option but to accept the offer or miss out on their career. They are obliged to overlook the interests and welfare of their Christian community for their own survival and sense of security. Christians who refuse to compromise their principles lose out. Many Christians immigrate rather than stay and live with humiliation. Boutros Ghali, former United Nations Secretary General, (1992-96) is a Coptic Christian, not an Arab. The Coptic Christians trace their ethnic roots back to more than 2000 years to their Pharaonic ancestors. The Copts have their own native language, spoken and written. The Egyptian government defines the Copt as an Egyptian Arab. In fact a Copt is an Egyptian Christian of Pharaonic ancestry. Copts are the indigenous people of Egypt. The Copts were there long before the invasion of Egypt by the Arabs and its conquest in 639 AD. The Egyptian Government closed all schools of the Copts and banned their language. Later, they restricted their Coptic language to liturgical services only. The Egyptian government has totally replaced the Coptic language with Arabic. The Copts in Egypt conduct their sermons in Arabic and have since been officially categorized as Arabs. What Boutros Ghali needed to do, while in office, was show some concern to the sufferings of his Coptic people in Egypt and turn his attention to similar situations in other countries where ethnics are suffering from Islamic pressure under military and despotic regimes. One of his priorities should have been to restore the rights of his own suppressed people in Egypt. They have been living under the yoke of the Islamic rule for over a millennium. During his term of office, Boutros Ghali evaded indigenous issues and his general viewpoint on the rights of indigenous natives was obscure. He was pressured to follow the policy of his Arab masters. Islamic policy is against the revival of cultures of the indigenous peoples of the Abode of Peace. For Boutros Ghali to empathise with them would have led to retribution under the millet provision. Boutros Ghali tagged along sheepishly as an obedient servant of his Arab Islamic overlords. His lack of enthusiasm and oblivion to indigenous issues was very disheartening. His slow performance, in general, did not warrant renewal of his office for a second term. As a prelude to the efficiency of the United Nations, the Secretary General has a moral obligation to expose the inhumane treatment of the indigenous people, to help alleviate their sufferings by urging oppressive regimes to reform their constitutions. One of the main tasks of the Secretary-General is to encourage UN agencies to work for the restitution of the rights of the aggrieved in par with other true democratic nations. Responsible persons holding such a high post should come to the rescue of people living under brutal regimes. The indigenous people ceaselessly try through their elders to demand their basic rights but since they have no voice to represent them in their respective governments, they look up to the UN to alert the world to their sufferings. Without persistent pressure by the UN and the international community, dictatorial regimes will not respect the UN Charter by which they are bound. They will continually ignore the international laws in breach of all conventions. Alternatively, the UN Secretary General office entitles him to play a more active role in pressuring such regimes to introduce constitutional reforms or force them to let go of the indigenous people and grant them some sort of autonomy. 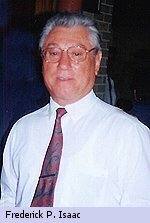 Unfortunately, the likes of Mr. Ghali are not shining examples in advocating basic human rights to the suppressed indigenous peoples. Tariq Aziz is Assyrian and not an Arab. To distinguish a member of the Assyrian Church of the East (ACE) from a Catholic, an Assyrian ACE is called Nestorian. The Assyrian Catholic is called Chaldean - Chaldean in this instance signifies a Christian denomination and not a nationality. (Chaldean, implies a Catholic of Assyrian nationality with affiliation to the Papal Church). Tariq Aziz distances himself from the Assyrian �Nestorian� community. His Assyrian christened name is Mikhail Hanna Aziz of the northern village of Qaraqosh. He conceals his Assyrian nationality for his own selfish ends, self-promotion and false Arab nationalism under the banner of Al-Baath Al-Arabi (Arab Resurrection). Though he has retained some of his Assyrian characteristics, he has drifted into the mainstream of his immediate surroundings and lost much of his Assyrian heritage. His mother tongue is Aramaic-Assyrian and he speaks it fluently, yet he denies being of Assyrian origin and camouflages it because of his contentment with his achievement. He lacks the national pride in his genuine nationality and camouflages it because of his defeatism. Many such Christians in the Arab world, though eloquent, are but sham officers - a replica of the old Ottoman Janissary/Mamluke, either as a civil servant or member of the military corps. 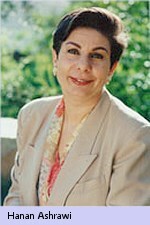 Hanan Ashrawi is Special Adviser to the Palestinian Cabinet and Minister for Higher Education. Whenever a political issue develops and reaches a crisis point, she is thrown into the political arena as a spokesperson and joins the front lines in street demonstrations in defence of the Palestinian cause, exposing her life to unnecessary risk. Occasionally, Christian individuals participate in protest marches and long noisy processions. They walk alongside their Moslem partners, in full support of the slogans they carry, chanting with vehemence against the West. The reason behind such conduct lies in their background. Stretching one�s memory back into history, the image of the Janissary/Mamluke flashes past. Christian participation in such activities is orchestrated to ensure their survival in such a hostile environment, having nowhere else to go to escape the growing hostility against them. Usually such performances are the result of self-preservation rather than being sincerely spontaneous. On other occasions, Christians are appointed as spokespersons to represent the Moslems at home and their communities abroad. They allow such enactments to give the world the impression that Christians in the Abode of Peace and War have the same rights and are equal in every respect. The truth of the matter is exactly the opposite. The Islamic government finds its state religion in conflict with the Christian faith and therefore considers the Christians at home untrustworthy to assume responsible posts. They live and function within restricted guidelines of their overlords. At home, they are kept away from sensitive posts, especially the police, military and diplomatic corps. Abroad, the Moslem leaders consider the Christian �Arabs� as their potential ally, to be used when the need arises. They maintain a relationship but it has a low profile with leaders of the Christian community. Such Janissary/Mamluke persons are isolated from their Christian community, at home. They live within a very small social circle. They are pawns in the hands of their Moslem masters and are restricted in their views and actions. They are allowed to criticise the West but not their political opponents at home. They cannot openly serve and promote the interests and culture of their Christian community or advocate true democracy. Listeners and viewers wonder with admiration as to why their Moslem sponsors themselves do not discuss such conflicting issues with the same conviction and vigour as their Christian counterparts. Going back into history, the Janissary/Mamluke comes to mind. To escape their choking environment and uncertain future, many Christians sadly forsake their ancestral homeland and seek refuge in Western countries rather than live a subservient life. Christian persons that foster issues relevant to their culture and environment openly and boldly usually meet with a tragic end. Islamic governments have accused such proactive Christians either as communists, foreign agents, or working in the interest of foreign policies and evangelism. Traditionally, the Moslem hierarchy employs means to attribute accomplishments of the Christians to their own Islamic achievements. Antoun Sa�ada, founder of the Hizb Al-Qawmi Al-Souri Al-Ijtima�e (The National Syrian Socialist Party) was apprehended while transiting through Lebanon to Syria in the Summer of 1949. He was arrested and summarily tried and hanged. Antoun�s personal assistant Abdul Msayyeh was hunted down through the Chouf region in Lebanon and eliminated. Michael Aflaq, founder of the Hizb Al-Ba�ath Al-Arabi Al-Ishtiraki (The Arab Resurrection Socialist Party) in Syria had to defect to Iraq to escape persecution by the Syrian Government. To survive in Iraq, he had to compromise his religion. Earlier, while in Syria, he had named his first son: Issa (Christian) and the second: Mohammad (Moslem). He was estranged from his family and died in banishment in Iraq. To honour him the Government of Iraq gave him an official Islamic burial service and described his accomplishments as Islamic achievements. Other Christians like George Habash, Leader of the Popular Front for the Liberation of Palestine (PLFP), and several splinters and names like Nayef Hawatmeh of the Popular Democratic Front and Wadi'e� Haddad, have lost their shine and live in obscurity. Many Egyptian Copts that performed acts of bravery during the liberation period and Israeli-Egyptian wars, have since disappeared from the scene and been forgotten. They were all Christians, treated as Janissaries. For a Christian to act and effectuate change on his own and represent his Christian people, independent of the mainstream Arab/Islamic interest is suicidal. To choose the lesser of the two evils does not help much either. Such capable persons, not being able to openly help their Christian community, contribute their efforts to introduce social reforms in the hope of improving the lot of the overall majority of the people from which the Christians would also hope to benefit. Because of difference in ideology, Christian contribution always tilts towards social reform, which the Moslems dismiss as communistic or Western trend. This conflicts with the Islamic culture. Whatever leeway these Christian Janissaries are permitted, they must exercise their personal freedom and judgment in accordance with the Islamic tradition as established by the Islamic (Shari�a) law. Any deviation, results in Christian contributors to be ignored. They are shunned and fall from favour. They often end up being trampled underfoot. Whatever benefit is derived from such brilliant people, in the aftermath of the events, is attributed to an Islamic era and enters the annals of history as Islamic reforms. They are the neo-Janissaries of modern times -- intellectuals, born and bred in a discriminatory hostile environment; conditioned and maintained to perform errands and tasks that please their Islamic masters for the spread of the Islamic cause. Islamic states are signatory members of the UN, yet most of them ignore its Charter, and a few like Iraq, Algeria and Indonesia ignore many of its resolutions. They introduce and enforce their own harsh laws. They leave no room for dialogue and sensible negotiations with native leaders of non-Islamic faith. It is a disgrace to the international community and, especially to the UN, the guardian of human rights to allow this sort of behaviour to continue. Christians have already taken the initiative in propagating their cause in all sorts of ways. They have made constant appeals, tried to enter direct negotiations with their Moslem counterparts, launched armed struggles, like in Lebanon and Northern Iraq, and publicized their plight via various media organs. All come to little or to no avail. The indigenous people need full support of the world media and the attention of the international community through the UN agencies. It is the duty of the UN to intervene and assert itself firmly in support of the aggrieved and dispossessed people that are struggling to restore their usurped rights. The UN represents the world family. Any inadequacy, on its part, encourages Islamic regimes to continue with their policy of discrimination and oppression against non-Moslem natives. Lack of concern or using a soft approach by the UN towards oppressive regimes is a bad reflection on her image and that of the international community. Indonesia and Nigeria and even Sudan seem to have gone wild lately in their persecution of the Christians, in the name of Jihad and Shari�a Islamic law. Islam treats the Christians as household property. Christian life has no value when it comes to assertion of their Shari�a religious law. The heavy-handedness of the Mongol Turks and Iraq�s brutal regime and repression of the indigenous Assyrians in the north is a vivid example of the impotence of the UN. Sudan�s cruelty and inhumane treatment of its impoverished people in the south shows how powerless is the UN. In this regards, it is constitutionally weak, or lacks the authority to enforce its resolutions forcibly and allow it to intervene successfully against such flagrant violations of human rights. Living in safety of their governments, disciples of (Al-Da�awah) the call to Islam receive training in guerrilla warfare, sabotage and armed combat. They take up the aggressive approach in spreading their religion to expand the landmass of their domain in the name of Allah�s army of Jihad, instead of holding dialogues and preaching the message by peaceful means. The Western world needs to reconsider and perform a complete �overhaul� of their relationship with sectarian regimes that suppress freedom of religion. Lack of reciprocity by the Abode of Peace and unconcern of the West is perceived as endorsement to Islam�s growing animosity towards non-Islamic indigenous religions. The continued indifference of the States of the Abode of Peace to the intolerable situation of the indigenous Assyrians encourages Jihad, with the discreet approval of their governments, to continue with their discrimination policy against the Israelis and Christians in the Middle East. The call for Al-Da�awah (the Mohammadan message) is spread with militancy at home and abroad, suppressing the native people their right to practice their culture freely. It is noteworthy to examine Islam as a unit, as whole social structure, with its head Arabism, to try to understand its concept and the extent to which it wishes to expand and outstretch its physical borders of the Islamic Umma nation as a political body. Propagation of its mission seems to have no boundary. Execution of human rights activists by Nigeria�s regime, and repression of the Ogoni tribe and the Christian people in general, are some more open acts of defiance. United Nation's inaction encourages such regimes to continue in their persecution and committing of violations against the embattled aboriginal people, unperturbed and without fear of UN retribution. Persistence of such Islamic states in affirming their state religion as supreme is a testament to the failure of the U.N. in stopping the systematic persecution of the Christians in the Abode of Peace. Unless they become Moslems, the Nigerian Christians are destined to be literally hacked or starved to death. The term �Commonwealth� in Islamic countries is given to mean for the common good, exclusive to Islam. Why should the land, resources and wealth of the country be shared among the Moslems themselves, and not with the Native Christians? The UN has a moral responsibility to act against government misrepresentation of the people, corrupt leaders and oppressive regimes that do not comply with certain UN constitutional guidelines. Without secular constitutional reforms cruelty and injustice will continue. Corruption, nepotism and bribery become rampant, while the general population sinks deeper into impoverishment. The hardest hit are always the dispossessed Christian natives. It is not surprising that the West could not apply the same policy of annulment on the Arabs in Palestine as it did on the Assyrians during the mandated periods of the Middle Eastern region in the immediate aftermath of the World War One. The Mandated Powers abolished the map of Mesopotamia. They dismembered it, including the physical map of Assyria that until 1922 had existed in the World Atlas. By doing so, the League Council annulled the national identity of the Assyrian people, extinguished their political status and classified them as Christian minorities of various denominational �millet� groups of specious backgrounds. The Assyrians of Hakkari-Van, Turkey and Urmia, Iran were evicted from their native land. They ended up in the Province of Mosul. Some were rehabilitated in isolation of their kinfolk in Iraq and Syria. Others were dispersed into the Moslem majority and the rest were left stranded. They were scattered all over the Middle East and left to fend for themselves with a view to their gradual assimilation. The Council�s illegal action led to fragmentation of the Assyrian people. The Assyrians were dispersed into the Arab-Islamic states in a bid to integrate them with the overwhelming Islamic majority. The Mandate�s objective was to extinguish the Assyrian legitimate claim to their ancestral land. They were dispossessed and left at the mercy of their traditional enemy, without any subsistence or concern as to their future. The Palestinians rejected such a ploy. They objected to the Mandate�s unfavourable policy of a coalition government. They resisted the Mandate�s fragmentation scheme to be vanquished into the neighbouring Arab states. They adamantly fought the dispersal policy and sought the help of the Arab governments, resorting to jihad. The Islamic countries and later the Arab League in the early sixties supported the Palestinians in retaining an Arab identity, by classifying them Palestinian Arabs. The Abode of Peace welcomed the Palestinians to reside in their countries as temporary guests, classifying them as displaced refugees. The Palestinian travelled with a passport issued by the host government visibly marked �Bearer is of Palestinian nationality�. Bearer of the travel document was identified as a refugee and not a naturalised citizen of the Arab host country. The Arab League maintained this course of action to preserve his Palestinian entity, in anticipation of reclaiming the whole territory under the British Mandate as Arab Palestine. In the case of the Assyrians, the League of Nations classified the Assyrian people a minority and not as displaced refugees, eluding the world that they were living in a host country and not on their own Assyrian soil. The Assyrian nation was fragmented into several denominational groups with the object of their assimilation in several neighbouring Islamic countries. They were termed alien �millets�. The West did not divide Mesopotamia according to the need and legitimate rights of the native dwellers of the region. The victorious Western Powers divided it to satisfy the Arab-Islamic wishes and for their own political reasons and economic benefit. The Mandates redrew the political map of the Middle East. They created Arab/Islamic countries and handed over the whole of the Middle Eastern region to the Moslem occupiers. The legitimacy of the other Middle Eastern dispossessed nations, Jews and Assyrians, was ignored. They failed to protect the traditional territories of the native settlers that rightfully belonged to them from time immemorial. Restoration of Israel and Assyria, under protection of the League of Nations would have created a healthy equilibrium and struck a sound balance of power among the several diversified ethnic groups, different in language, culture and religion. Just distribution of land, by the Mandated Powers, would have been a positive move, assisting in the long term stabilization of the region, easing of tension, and creating greater awareness of their sovereignty and respect for each other�s rights and borders. It would have contributed towards attainment of closer rapprochement, and durable peace in the Middle East. The native inhabitants have not benefited anything, not one iota from the Islamic rule, especially the indigenous Assyrians; they have suffered the most. To do justice to the traditional inhabitants of the Middle East, the world community needs to reconsider its policy in regards to the indigenous peoples of the region. From day one, the Islamic regimes were built on shaky grounds. They never had a civil system of government based on secular democratic principles in the first place. Their system was either tribal or sectarian. The Arabs and their predecessor the Ottoman Turks ruled by the system of the Consultative Council (Majlis Al-Shura), a system inherited from days of old that had emerged and developed into a ruling cult with the inception of Islam. Their Council (Majlis) was a body made up of warlords, tribal leaders, close associates and powerful members of the ruling clan. After the death of the prophet, the Islamic nation was headed by the Khaliphah, the successor of the prophet and ruling head of all Moslems of the world for life. The Consultative Council (Majlis Al-Shura) did not rule by a written constitution. Islam, in its precept, strives to assume world dominance, by whatever means available to it, mainly by force, through traditional jihad. Its religion, they believe, will be applicable to all people, to all time and all places on earth. To them, it is universal and eternal in the sense that it will be the domineering religion worldwide. A secular constitution does not agree with the Islamic rule of the Shari�a religious law (Pryce-Jones, 1989: 354; Mawdudi, 1992: 115-116). Many Islamic regimes have grabbed so much territory, wealth and absolute power that they have become breeding grounds for terrorism, enhancing the revival of the past glory of the Islamic empire through jihad, holy war. Instead of putting their resources and wealth to good use, they waste it. They squander it in billions. They burn it, burning others with them. Instead of the Islamic States of the Abode of Peace using their rich resources to establish a pluralistic society and share their country�s wealth with their sister states, they go buying weapons, building armies and blasting people and themselves into oblivion in the name of Nashr Al-Da�awah, the call to Islam through Jihad. Instead of investing in education to reform some of their ailing states to derive social and economic benefits, giving their people freedom of choice to find their rightful place in society, and become part of the global family, the Abode of Peace States stifle their people with segregation and suppress their freedom. Being representatives of Allah, theocratic rulers of certain Islamic states of the Abode of Peace like, Iraq, Iran, Afghanistan and Somalia silence opposition, suppress civil liberty and impose stiff restrictions and obedience on their subjects in accordance with their Islamic religious order, dragging others with them to a degrading lifestyle (Aburish, 1995: 54-55). The long-term objective of the Abode of Peace states is to keep their disillusioned subjects at bay for fear of manifesting disloyalty and dissension because of their continued suppression. Their actions are in execution of their fatwa, using force to control the world society and run it in accordance with the principles of Jihad. Beginning with the Abode of Peace, such as in Iraq, Saudi Arabia, Iran, Afghanistan, Egypt, Sudan, Algeria, Nigeria, and Indonesia, irregular armed bodies pop up as killing tools to silence any opposition move and eliminate their resistance. They disappear and melt away never to appear again until called upon by their Conservative Power Challengers (CPC) hardliners to resume their terrorism in other selected countries in the Abode of Peace and War. In the Abode of War Mujahideen keep the Western society in fear of terrorism. Here, the Mujahid guised as a gentleman of the West, plays the role of movie star persona with deadly seriousness following the script as a dedicated performer, with strict observance of the rules to achieve the highest mark in fulfilment of his assignment of death for the sake of Allah. The so-called Islamic moderate governments do not seem to have the will and courage to dodge, and constitutionally dissolve, the three militant groups of the Muta-we-ah, Militias and Mujahideen to set their socially and economically ailing countries along the path of constitutional democracy. They are prisoners of the CPC and the clerics. Indonesia is one of the leading countries that finds it difficult to veer away from the three irregular armies to run its government on the road to secular democracy. The so-called moderate countries need to ease their grip on some rigid sectarian laws. To make changes, they need to redirect their system to proceed along the path of secular constitutional democracy. Moderate leaders fear immediate backlash from the CPC (conservative power challengers), who are backed by religious authorities and fanatical Islamist supporters. For the moderate leaders, it is a risky venture to even contemplate disarming irregular armed bodies that have been formed in the name of Islam for its protection and expansion. It usually costs the secular orientated leaders their life. Left unexposed and unchecked by democratic institutions locally and internationally, the Islamic governing system takes the shape of absolutism and legitimises it rule under the guise of false democracy. It is a system that weighs very heavily on the freedom of its citizens and indigenous communities in the concept of democracy. Bribery, nepotism and corruption become rampant. It is not surprising that the financial books of most of the Islamic countries are often in the red, with a deficit in their budget. (Pryce-Jones, 1989: 225-226, 249; Committee for the Support of the Saudi Arab Woman: 1991). By considering the Khaliphah (Successor of Mohammad) as head of the Islamic government and the Islamic (Shari�a) law as the only way for an Islamic government system, little room if at all is left for secular reformation. Reversion to traditional Islamic rule without an overall eligible and recognised spiritual Khilaphah leadership is unachievable. Without constitutional change to pluralism on the other hand, democratisation is unattainable. Despotic regimes are clogged in the quagmire of their own iniquitous social system. Lack of civil liberty and personal choice impedes progress. Internal conflicts, corruption and violence become part of the ruling system, leading escalation of the ferocity of the conflict to outright war. The bullet instead of the ballot box becomes the rule of law. Free thinking is suppressed. Formation of voluntary institutions to promote rapprochement and social justice among citizens of diversified cultures remain non-existence or ineffective at best. Establishment of Islamic social clubs, cultural societies, public swimming pools and entertainment centres are discouraged. Social group activities of the ethnic communities are disallowed. Formation of sports clubs, mixed cultural centres and aboriginal societies are looked upon as foreign and un-Islamic. The very few that exist are put under constant surveillance. Civil liberty, freedom of expression, graphic arts, figural representation and general sports activity for the female gender are considered unethical and strongly discouraged. In the turbulence of all this, the non-Moslem communities are dragged alongside the continued unrest of the Islamic masses. Moslems live with a one-track mind, believing that their way is the only true way to salvation. Yet they fail to manifest to the world that the methods they apply in spreading their mission are peaceful and not by committing acts of terrorism in the name of religion through Jihad but by being open to dialogue and, sharing with the rest of the religions in the good that comes out of such dialogues � to keep that which is good and discard that which is not (Na�kol Al-Lobba Wa-Narmi �l-Qushuor). Presently Afghanistan is growing opium with the excuse that its government needs hard currency to survive. Instead of accepting change and opening up to the world and resorting to constitutional change to reform its ailing economy, through freedom of the individual, freedom of expression, education and social justice, the Afghan Taliban government continues to repress its people, plunging the country into total darkness of ignorance and deprivation. (Hiro, 1989: 6,12, 27, 41, 56, 122; Pryce-Jones, 1989; 122-123; Polk, 1991: 43, 48; Aburish, 1995: 105-106). Relief organizations and aid agencies can only help in a limited capacity, in the field of distribution of food, medicine and temporary shelter. They cannot change the social structure of a country suffering from long endemic social problems, resentment to change, political instability and absence of democracy. The bullet echoes only to cries of terror and death and reverberates with sighs of loss and grief. Nothing good comes out of violence and coercion. To bring positive change, Sectarian leaders of the Abode of Peace claiming high democratic values need to take up courage and open to the world, in cooperation and equal opportunity towards gradual transformation of their country to growth, stability and peace. Countries living in isolation of their narrow mindedness resemble a tree trunk that eventually becomes hallow and crumbles on itself. Without the uniformity of a written democratic constitution representative of all the people, despotism will continue. Lack of a mechanism for a lawful system to control power, leads Islamic regimes to absolutism and corruption. In the Abode of Peace, Islamic law does not allow Christians, let alone Jews, to hold any high official post in the Ministry of Interior, Foreign Affairs, Defence and Justice, specifically in the legislative council, in courts and judicial branches of any Moslem government. This ban covers all the Moslem countries. Non-Moslems are not allowed to judge Moslems in their Abode of Peace States. It is against the Shari�a Islamic law for a Christian or Jew to condemn a Moslem. As a rule, non-Moslems are not entrusted with any power of office that would directly or indirectly challenge a Moslem. Regardless of status, rank or social position, the Moslem in an Islamic court always comes out the winner if his accuser happens to be non-Moslem (Burns, 1994: 87). How just and successful a secular system becomes in an Islamic government depends mainly on how much freedom they are prepared to give the other non-Moslem aboriginal nationals, and how much they are allowed to exercise their basic rights equal to the rest of the citizens. With the steady rise in fundamentalism, room for compromise is bitterly disappointing and remote (Hiro, 1989: 121; 178-179). The duty of the international community is to deliver the indigenous people from the clutches of such rigid and oppressive regimes by allowing them to rule themselves. They would certainly be by far much better off in every respect, than living under a system of fanaticism and haphazard nature. Bosnia�s new situation arising from the fall of the Soviet Union constituted a threat to the stability of the neighbouring countries and Europe. With the intervention of the UN peacekeeping force, the escalation of war was confined to within former Yugoslavia. Later, with the direct intervention of the United States and deployment of NATO forces, Bosnia was enabled to break free. Scathed and battered, yet with the assistance of the international community headed by the United States, Bosnia is now hopefully on the road to full recovery. The international community gave Bosnia preferential treatment. It prioritised its case. It allowed the Moslem Bosnians to jump the queue before scores of other peoples. Like the aggrieved Greek Cypriots, the people of East Timor, the persecuted Christians in Southern Sudan, the Biafrans in Nigeria, the Copts in Egypt, the Assyrians in Mesopotamia (Iraq), and scores of other wronged peoples in France, Spain and Latin America. There are scores of indigenous peoples that have been under oppression for decades, if not centuries. World bodies classify matters of such magnitude as local problems. They describe them as internal matters that should be resolved domestically by negotiation with their respective governments, as if such tragedies came about by themselves and had not been the direct cause of encroachment by foreign Western and Eastern invading powers. Upholders of law should not act outside the law. No one should be above the law. Bosnia while seeking a peaceful solution to its problem, also took up arms. It waged armed resistance for its independence. The Mujahideen backed clandestinely by the Abode of Peace States were also involved, including the Saudi and Iranian petrodollar. Bosnia succeeded because certain super powers, the United Nations and the international community supported the move. Now that Bosnia has regained it sovereignty, it is hoped that it will not make the same mistake as the rest of the Abode of Peace states by changing its approach and adopting unfriendly attitude towards other factions. That it will take a firm stand in dealing justly with all the different ethnic groups, and not provoke social and religious conflicts. Regardless of ethnicity, all the Moslems, Christian Catholics and Christian Orthodox citizens of Bosnia and gypsies should be treated as equal, before the secular law, irrespective of colour, creed, gender and civic status that they may all live in peace. Like the rest of the Islamic states of the Abode of Peace, there are signs Bosnia will eventually change its present friendly attitude towards the non-Moslem citizens, by starting to behave unpredictably. It is following the direction of Turkey, Iraq, Nigeria, Algeria and Indonesia in its policy towards the non-Moslem indigenous population. There is a sense of growing unrest among the Bosnian Moslems in regards to apportionment of the government parliamentary seats. The Bosnian Moslems are unhappy to share power with other ethnics. To display their displeasure, the Bosnians resort to prolonged tactics of showing themselves as the victim of the same representatives of the ethnic groups that have partaken in ruling the country. The Croats are restless, the Serbs are numbed and the gypsies live in bewilderment. The Bosnian Moslems continue to demand justice to crimes committed against them and want all the Serb and Croat suspects to be arrested and tried in criminal courts. Such attitudes come out of deep bitterness and uncompromising approach of their irresolute demand for absolute power, always resorting to force at the outset. It shows an adamant persistence and determined effort on the part of the Bosnians to neutralize the Christians, in collusion with certain rogue elements in a continuous campaign to systematically diminish the role and responsibility of the non-Moslem officials and pass it on to the Moslems, in a bid to curb their influence in policymaking decisions. The Bosnian government intends to isolate the native Christians from public office and curb their influence to discourage them from striking deeper roots to remain on their soil and property as true citizens of the country. By adopting a negative approach, the Bosnian Moslems create problems and make it difficult for ethnics to go about their daily business, whether in rural or urban areas, as witnessed in certain controlled parts of Macedonia and the whole of Kosovo, Serbia. Similar to what is currently happening in Kosovo, Bosnia�s policy is to ensure that the reins of power of the Moslem government are regained and remain wholly in their hands. The Moslems are not happy with the three-member rotating system of presidency. Their long time ambition has been to perpetuate Moslem cultural customs and Islamic law; and draw Bosnia closer to Dar Al-Silm states by creating social obstacles and religious provocation. The long-term intention of the Bosnian Moslems is to palisade Bosnia with Islamic culture and bring it under the protection of the Islamic Umma nation. Bosnian Moslems prefer the world media to refer to them, by their creed, as Moslems. While the Bosnian Moslems refer to the native Christians as Croats, Serbs or gypsies to give the world the false impression that Bosnia�s religion is Islam and its overwhelming inhabitants are Moslems. Bosnia was a Christian kingdom, never a Moslem state except by incursion and compulsion. If Bosnia�s government system is secular, why be called by their creed? The Balkans being ruled by the oppressive Ottoman Turks for over five centuries until the early 20th century (1396-1922) does not mean that it was predominantly Moslem. Like their Arab counterparts, Turkey seems to have an eye on the Balkans. The Albanian Moslems relying on the Moslem Caucuses as their potential allies have begun ruffling their feathers too, in preparation to spreading their wings towards Greater Albania. Turkey has a secular government, yet once it shows signs of weakness and starts to crack before the upsurge of Islamic fundamentalism, it will be overpowered and replaced by the growing CPC. Standing at the threshold of Europe, if Turkey had a succeeding non-secular government, it would be incited to join the Abode of Peace States and adopt the hidden agenda of the Abode of War. Turkey would become the main gate, hinging on the support of Mujahideen forces of the Caucuses and the Middle East, turning its guns on Europe to regain its former glory in the Balkans. Its nostalgia kindled by the memory of its old glory in the Balkans is a potent incitement for the Abode of Peace to complete the link that would have a front extending from the Caucuses to the northern shores of Africa. Pakistan and Iran would be the nuclear backers. Europe would be a safer place if Turkey were allowed to join the EU (European Union) on European terms. It would encourage Turkey to distance itself from the Middle East, with allowance for independence to the ramming Kurds wedged in the Kurdistan Mountains. In like manner, to allow calm to overwhelm the Middle East, U.N. is called upon to give serious consideration to the Assyrian issue. Restoration of Assyria to its legitimate status as an independent state would be the more helpful stance in stabilizing the region. Assyria would require the full protection of the U.N. and the international community during its transitional period to gain complete independence and sovereignty over its territory. As a scattered nation of about five (5) million, collectively, its people have all the prerequisites to gain recognition and return to their homes. Islamic governments of the Abode of Peace imply that remnants of ancient kingdoms and vanquished peoples, in the Middle Eastern region, have long assimilated with existing Arab population of present-day countries. They claim that their small number, though had historical links to their ancestral land, are no longer qualified to claim it. Islamic states allege that the indigenous nationals were residues of ancient kingdoms, reduced to insignificant minorities by prior conquests. Over time, they lost their genuine identity, and have since melted into the Arab-Islamic pot and assimilated with nationalities of other countries locally and abroad and become extinct, like the Assyrians, Jews, Copts and Berber. This is the rhetoric of the Islamic States of the Abode of Peace. They cherish the illusion of deceptive notions to the point that many historians and academics go along with this fallacy. Many historians and scholars have written numerous books and presented papers in support of such distortions about Assyria, either out of ignorance or for disinterest in a small population with a complex contemporary history, focusing only on Arab issues. Since dismemberment and removal of Assyria from the physical map of the World Atlas by the defunct League of Nations after World War I, Assyria was officially extinguished and its people taken to be vanquished. No academic study has as yet been done on the Assyrian contemporary history with serious depth. As a result, Assyria�s history is suppressed. It is associated with Islamic History, touching on it as an insignificant minority subject. The Abode of Peace States allege that the indigenous groups of the Middle East have become subjects of the countries in which they now happened to live. They claim that the Assyrians were drawn into the mainstream of the domineering rulers during the Roman Empire and subsequent Arab and Ottoman Turk invaders, who forced upon the indigenous remnants the Islamic rule of law and have since succumbed to the inevitable. This is a sham in order to erode further the Assyrian identity and claims. Assyrians are not recognised. Statistically, the Assyrians are not officially recognised as a people on their own. They are no longer known as a nation or �a people without a country� but as subjects of the country they reside in such as Iran, Iraq, Turkey and Syria. Not recognizing them as Assyrian nationals and denying their basic rights to their historical homeland, the Islamic States of the Abode of Peace suppress all attempts of the Assyrian people to expose their hideous crime. The Assyrian racial identity was officially invalidated, with the dismemberment of Mesopotamia, within which Assyria had been situated, and its one and a half million people then, scattered all over the Middle Eastern region. They were forcibly banished or dissolved into the neighbouring Islamic states. In the eyes of the world, the Assyrians are extinct. Israel, Assyria, Mesopotamia � the whole of the Middle East was handed over to the Arabs and declared Arab territory. Their language, culture and heritage, is systematically being eroded without any concern from the UN agencies, in particular International Human Rights and United Nations Educational and Cultural Scientific Organisation (UNESCO). Textbooks on Assyria have been officially removed by the Ministry of Education of Iraq from its curricula. Iraq relates the culture of Mesopotamia and Assyria to Arab history. It gives Arab names to Assyrian landmarks and agricultural implements and other historical features and historic sites. Such statements are usually endorsed by European archaeologists, which further suppress the truth and falsify their authenticity. Bosnia, backed by the Islamic states of the Abode of Peace, is behaving in the same manner. It is reviving the call to Jihad with encouragement from the ever-growing fundamentalist groups in Turkey. Fermentation of this resurgence is taking place in the occupied sector of Eastern Cyprus. It is their safe haven, as is Kosovo to the Albanian rebels and Islamic States of the Abode of Peace to the Arabs. Taking other people�s land by force contravenes international convention. The key issue here is Moslem seizure and usurpation of other people�s land. When or by whom, yesteryear or centuries ago, by Arabs or Turks, is irrelevant. The Israelis and the Assyrians are the indigenous owners of their traditional lands and have the legitimate right to retrieve it through the International Court of Justice at the Hague and other legal means. Since banishment of the Jews from Israel by the Romans in 71 and 131 AD, it became traditional by the succeeding conquerors and foreign occupiers to debar the Jews from frequenting their holy shrines and institutions. They had to buy their way in, back to their ancestral land (Gilbert, 1998: p30-31). They imposed restriction on their travel to Jerusalem and prevented them from returning to their home, Israel. The Jews were excluded from the Temple Mount, also known as Mount Moriah. The Temple Mount was out of bounds to the Jews. Since the capture of Jerusalem by the Arabs in 638 AD, Islam has systematically destroyed Jewish and Christian shrines. It incorporated the Temple Mount into its religious assets by first building an Islamic sacred shrine on it, then the Dome of the Rock and in the eighth century Al-Haram Al-Sharif of Al-Aqsa Mosque. With the passage of time, the Temple Mount became the sole property of Islam and under the exclusive control of the Arab Moslems. The Dome of the Rock and Al-Aqsa mosque are both built on the ruins of the outer courtyards of Solomon�s Temple. In 1881, the Ottoman central government, in a decree, banned the Jews from entering the so-called Palestine. Jewish pilgrims were allowed to enter the country for worship only and for no more than 30 days. In as recently as 1939, a British White Paper restricted Jewish immigration to their occupied home. Palestinians consider the Israeli settlers in their Biblical Land illegal, alien to their home Israel; and yet they consider any Moslem resident in Palestine as legitimate Arab national (Pryce-Jones: p187). The Assyrians are treated in the same fashion in their occupied region of the Middle East - they are categorized as either aliens or Arabs. 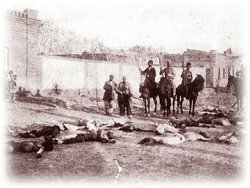 As for the Assyrians, their systematic massacres at the hands of the Arabs, Turks and Kurds since the Islamic conquests in the mid-7th century AD have reduced their population, robbed them of their land and restricted their movement to within the confines of their villages. They destroyed their infrastructure by destroying their amenities and by exacting heavy taxes on every adult and farm produce. Assyrian villages were forcibly depopulated. Their land and property were confiscated, and their churches and institutions systematically destroyed. They were not allowed to travel freely like their Moslem counterparts without prior official permission. They were not allowed to practice their culture and tradition openly and freely. The Assyrians were squeezed out of their wealth and forced to live the life of subservience for holding fast to their Christian religion. If the Palestinians exist, so do the Israelis and the Assyrians. The Palestinians are as ancient as the Assyrians and the Israelis. If the Arabised Palestinians believe that they are genuine and descendants of Philistia of the pagan Plishtayi and extant; then the Assyrians and the Israelis are extant too. The world of Islam (Arabs, Turks, Mongols, Kurds) by denying the Assyrians their existence, are also implying systematic massacres, and whole scale campaigns of genocide against the Jews and Assyrians in a bid to deracinate and exterminate them. The Assyrians and the Jews too, need to take their rightful place as a recognised people in the international community as any other nation in their own historical land and be part of the world family of nations in their traditional homeland of the Middle Eastern region. The Israelis and the Assyrians were forcibly banished and displaced by past and present invaders. Israelites and the Assyrians have every right to return to their homes, liberate themselves from foreign occupation and live in their historical land, free and under their own sovereign rule. Historically, as recognized nations, different in language, religion and culture, they lived within their own delineated spaces, totally independent from one another. Yet, according to the Palestinian National Covenant, the Arabs consider the Israelis as Arab Jews. As for the Zionists, the Arabs allege that the majority of the Israelis having lived, in diaspora, outside the so-called Arab Palestine, since their banishment, have forfeited their right to reclaim their historical homeland. The Palestinians label the banished Jews, foreign Zionists. As for the Assyrians, the Arabs allege that the Assyrian nationality was annulled, and with its annulment and removal of the political map of Mesopotamia from the geography of the World Atlas Map in post World War I, Assyria was extinguished, and that no mention should be made about it or its surviving people. In the eyes of the Arab and Islamic nations, Israel remains an alien state forcibly established on Arab soil. While they consider restoration of Assyria as another thorn in the side of the Arab Moslems � a real threat to the spread of Islam, and an impediment to the concept of globalisation of their religion and expansion of their Umma Nation. The Assyrians were divided into several Christian religious sects and considered different Christian minority �millet� groups to reduce their population count and extinguish their Assyrian national identity. The mandated powers, in collusion with the Arab/Islamic states, adopted the Islamic �millet provision�. Thus, Assyria was dismembered and its Christian people described as aliens, groups of different sects of unidentified nationalities. Islamic governments call them by the name of their religious leader or church affiliate and not by their own racial identity. The aim of the key power brokers was to deny the Assyrians statehood. The Assyrians are not aliens. In the immediate aftermath of World War I, by design of the Mandated Powers, the Assyrians were deliberately dislodged and became internally displaced within the Mesopotamian region. Locally, they were still the same people, on their own soil, native inhabitants of Assyria. Basically, nothing had changed except that they were cut off by creating new political borderlines that acted as barriers. The Assyrians territory was dismembered and fell under four different Islamic states. Henceforth the Assyrians were branded foreigners, aliens to their native land. By creating new Islamic states and kingdoms the mandated powers drew new borderlines, and scattered the Assyrians among Kurdish, Turkuman and Arab mobs. They alienated them from their homes in Hakkari, Turkey and Urmia, Iran. By this process, the Mandated Powers aimed to nullify the Assyrian racial identity and invalidate its political status. Dismemberment of Mesopotamia and decimation of the Assyrian people was a pre-planned Anglo-French scheme under the, 9 May 1916, Sykes-Picot Secret Agreement. Its implementation was encouraged and welcomed by the Islamic states. Sir Winston Churchill and T.E. Lawrence played an active role in keeping a tight lid on the Assyrian issue. As a result, the Assyrian issue was quashed by the Mandates, and put on hold. It has since been frozen and held in abyss. In the case of the Israelis, the Arab argument failed to convince world public opinion. In November 1947, Resolution 181 was passed by the United Nations in favour of a homeland for the Israelites in part of their Biblical homeland. On 14 May 1948 Israel proclaimed its independence. The three Baltic States of Latvia, Estonia and Lithuania and to a certain degree Poland went through such an ordeal in the mid-20th century. Yet, in the end they too legitimately reclaimed full sovereignty. The Assyrians are left unaided to continue to strive through legal means of the U.N. and the International Court of Justice to gain recognition.